Home ParentingPregnancy	Welcome Baby Calvin! I will be back with full updates soon, but for now I just want to say welcome to our newest family member! He is gorgeous beautiful and everything else that goes with new baby. He is perfect! Hope mama and daddy are doing awesome! Love u and congrats!! LOVE LOVE LOVE! Congratulations to you and your very own house of dirt & noise! That photo is absolutely heart melting. He’s adorable! So glad he’s here. Happy Birth Day to all! What a big and handsome boy! Congrats! O he’s beautiful and perfect!! Congratulations!!! congrats! I love the name you chose (my son is named Calvin too…we named him after Calvin from Calvin and Hobbes) he is a cutie patootie! Hello, sweet baby boy! Welcome to the world! Wow Congratulations! Another addition to your beautiful family. We love to hear more of your story! He is really a precious. 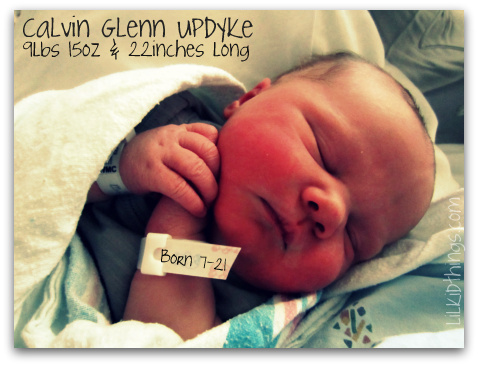 Welcome Calvin Glen! Welcome! Congrats to your new family member. So cute! What a little doll!! He’s gorgeous. And huge! You poor thing. Congratulations!! Congratulations to your happy family on the birth of little Calvin! Actually he’s a big boy!